The RV industry is moving toward the installation of LED (Light Emitting Diode) light fixtures. In some cases this involves simply equipping the existing lamp fixture with a LED bulb. In other cases, and in future designs, purpose built LED light fixtures that are a sealed unit will become the norm since the life of the LED's can be as much as 60,000 hours. 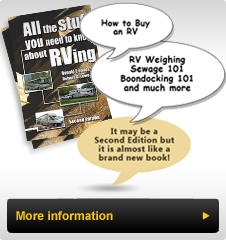 More and more RVers are deciding that they want to upgrade to LED's in their coaches and trailers. There are some basic principles that are important to understand before heading in that direction. In the last Tech Tips #71 we began this series and we'll walk through some of the principal factors about LED's and things to consider if you are upgrading or switching to LED lighting. This article is the second in this series. One notable characteristic of a LED equipped fixture over the comparable incandescent one is that the light is more directional than light sources we are used to. Light from a conventional bulb is emitted over the full length of the filament. In halogen light bulbs the filament heats the halogen gas which gives off a widely dispersed light beam. LED equipped fixtures have many individual point sources of light. Generally the greater the number of LED's, the brighter the light and the larger the "bulb". While there are more light sources, and brighter bulbs tend to have larger LED's, each one gives a point source of light. This feature tends to create definitive shadows and looking at the light directly can be difficult or even disconcerting initially. Fixtures with a smoked glass cover or sconce reduce this direct light source effect however many light fixtures are mounted with the open end down over a work surface (a light over a dinette, or a reading light as examples). Walking up toward the fixture one sees the light through the globe. When sitting at the table, or reading a book and looking up reveals many bright, individual light sources. This is different than what we are used to and requires a period of adjustment. I compare this to the adjustment required in our home after replacing conventional light bulbs with a Compact Fluorescent Light (CFL) bulbs; it took a period of time to accept the spiral glass as normal and acceptable especially in light fixtures designed with clear glass highlighting the bulb and maximizing the light output. Today it is the norm and rarely do we give it a second thought. LED fluorescent light replacements are available and fit the existing fixture using the same attachment pins as a regular tube however those pins merely secure the tube in place. The electrical connection is different and is connected in the area where the ballast is within the fixture. The ballast is no longer used. Connections are made to the power source, often at the power switch for the positive lead, and the negative side, often cutting into the ground wire going to the ballast. These LED "tubes" have a series of LED's running their length and when installed focus the light down through the lens. They provide similar light output with far less heat and much lower power requirements. Simply measure the length of the tube (usually 12 inches or 18 inches) and acquire the appropriate one. Since most RVers will be replacing incandescent bulbs with LED's some fixtures may not accept the LED Bulb and provide the light output required. Generally speaking the higher the light output (measured in lumens with a larger number indicating a brighter bulb) the LED bulb will have more individual LED's and be a larger bulb. The light fixture may not accommodate this larger bulb. Also consideration will need to be given to the orientation of the light fixture and its design. The common single and double light fixtures found in the storage areas and on ceilings of many RV's which contain a 1141 or 1156 incandescent bulb rely on a reflector to focus the light in a direction down and away from the fixture. A cylindrical LED replacement light bulb will not provide as much benefit and light output in that type of fixture. One replacement has a flat style LED board that has a wire and adapter to fit the light socket and the "board" containing many LED's is attached to the back of the fixture with double sided tape with all of the LED's shining down and away from the fixture. Another type incorporates the flat LED array into a bulb with the 'twist to install' bulb base. Sometimes it may be wiser to replace the fixture with a LED replacement. With interior lighting this may be difficult since the replacement will often be a different size and shape than the original and the ceiling material may have been marked by the original such that a replacement will always stand out. For consistency one may need to replace all the fixtures, further increasing the cost to upgrade. LED bulbs are rated in terms of the light output measured in lumens. This is different from what we are used to. Typically in a home you purchase bulbs according to the "watts" used. Thus a 40 watt bulb is not as bright as a 100 watt bulb and so on. The introduction of CFL replacement bulbs has introduced the trend of a 13 watt CFL which replaces a 60 watt bulb. Indirectly the manufacturers are stating that the light output (measured in lumens) of a 13 watt CFL bulb is equivalent to the light output of a 60 watt incandescent bulb. In the automotive industry light bulbs are sold by their "number" (i.e. 1156, 921 etc.) which combines the base style (bayonet, wire pin etc.) with the light output. Wattage is not a direct consideration. With the conversion to LED, power is greatly reduced (i.e. wattage), the light output can vary greatly and there are a relatively low number of base styles. Thus a measure of the light output is required to properly replace the incandescent bulb. The process is to choose the base style that fits the fixture and then select the light output and physical size to fit the light fixture. How much light is required is determined by what light bulb is being replaced as well as the function the light will perform. When RV's are manufactured light fixtures are sourced from lighting suppliers and usually similar fixtures are equipped with the same bulb. Thus wherever these fixtures are located the amount of light output is the same. For ceiling fixtures where there are many located in an area, having all the bulbs give the same output makes a lot of sense and the light output in that area is aesthetically pleasing. In other areas (for instance the bedroom) the wall sconces may simply be more decorative and likely do not need the same light output if that same style of fixture was installed in the living room. When replacing bulbs with LED's the opportunity presents itself to vary the light output to suit. This series will continue in the next Tech Tip.